The Coolcast glides on the waters of Key West daily. On any given day, Captain Mike Ledrew will be running the Coolcast, Coolcast Charters largest boat. For the past 15 years, Capt. Mike has been fishing Key Wests waters professionally. Getting on the water with either Capt. Ledrew can at times be challenging because of the high demand and their strong repeat-based clientele. He encourages calling ahead and reserving prior to your departure date. 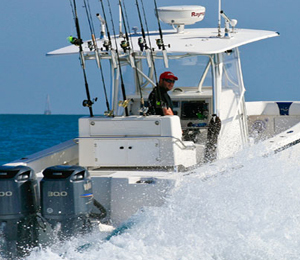 The Coolcast is a center console 36-foot SeaVee that takes to the rough waters with a smooth course. This boat is powered by twin 300 hp Yamaha outboards. To ensure your safety there is plenty of seating available on board. The largely proportioned T-top ensures your comfort by providing you shade from the strong Key West sun. For your convenience there is a spacious and clean bathroom available on board. And as far as electronics go, The Coolcast has TR 1 auto pilot, Ray marine 12 inch color fish finder, 12 inch color Garmin Chart Plotter, 2 vhf radios, CD player, and a cell phone. I have been to the Bahamas many times, but The Coolcast is one of my favorite trips! It includes everything that everyone should do here. As a Bahamas veteran, I can say only the best about this experience!